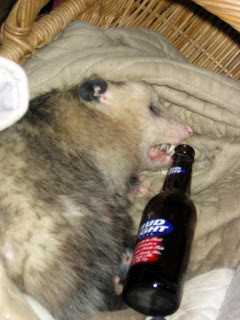 Ferny's blog: Our "Home Invasion"
This is a opossum, not to be confused with a possum. So, I just decided to share my wonderful bottled brew with the nasty furball. 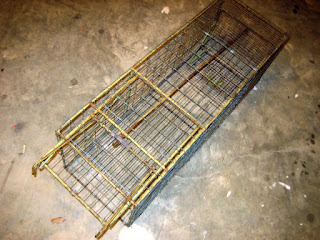 When I finished I picked up the basket he was lounging in and tried to "stuff" him into the live trap. 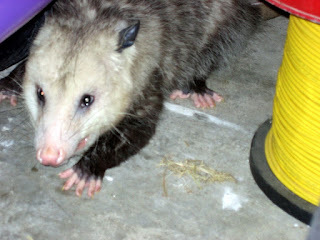 Dumb move....he quickly darted back into our garage. I gave it a tap on the head with a paint roller extension handle. I guess he didn't like that because left walking toward the street. He went straight to a curb gutter where he peered over the edge and decided not to go in. I approached him with the live trap which I had quickly baited with some apples slices topped with caramel sauce. It suddenly decided to jump into the gutter.....I don't really know if this was smart or dumb. There is no way for him to climb back up to street level. He's going to come back, even if you remove the food. 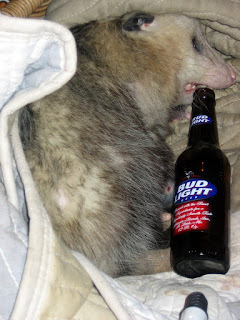 I heard the Budweiser clydesdales were laid off today....so, I will be sending Mr. Anheuser Busch this critter's resume. I think he'll work for free beer. Who should bailout the US automakers?